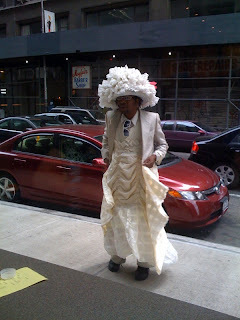 Things you see out the window when you're simply having coffee in New York City . . . He wasn't showing off to us. He was checking himself out on the window's reflection. Work it. Fierce. Project Runway? The photos above were taken months ago in Midtown. Then this past week while at Washington Square Park, we couldn't believe it . . . what the F? . . . it was our fierce friend again . . . hanging out in the fountain. New York is big but you still unexpectedly run into people. And wouldn't you know it, he was still posing!!! When he wasn't posing, he was splashing random people with water. Oh yes, notice the Chanel sunglass and tin foil bracelets. We prefer his earlier white ensemble over this color vomit aloha attire, but we appreciate the details he put into customizing the jacket. Somehow we were the only people that seemed amused or entertained by this gentleman. 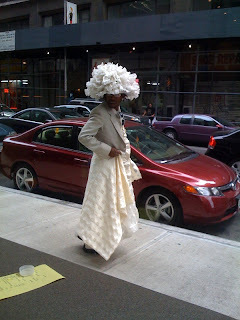 Only in New York.